A dragée (/dræˈʒeɪ/ drazh-AY) is a bite-sized form of confectionery with a hard outer shell—which is often used for another purpose (e.g. decorative, symbolic, medicinal, etc.) in addition to consumption. 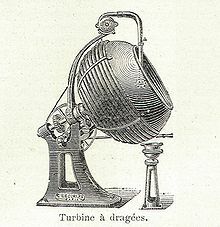 Spinner (turbine) used to apply sugar to the candies. A classic form of dragée and comfit, Jordan almonds, also known as mlabas (ملبس, lit. "coated" or "covered") in Arabic, sugared almonds, confetti, or koufeta consist of almonds which are sugar panned in various pastel colors. Jordan almonds are often used as wedding favors—like the Italian Bomboniere—with the "bitter" almonds and the "sweet" sugar symbolizing the bitterness of life and sweetness of love. The treats are often packaged in groups of five to represent happiness, health, longevity, wealth, and fertility. At Italian and Greek weddings, the almonds are placed in groups of five, an odd number that is indivisible to symbolize the unity of husband and wife. In the Middle East, Jordan almonds are considered an aphrodisiac so there are always plenty on hand for the newlyweds and their guests. Jordan almonds are thought to originate in ancient Rome, where honey-covered almonds were introduced by a Roman baker and confectioner named Julius Dragatus. His confections were called dragati and were served by nobility at weddings and births. When sugar became more readily available in the 15th century, the nuts were coated in sugar instead. In Sulmona, Italy, the technique of creating the dragée almonds was perfected by the Pelino family. The term Jordan is most likely a corrupted version of the French word jardin, meaning "garden", hence, a cultivated rather than wild almond. However, others suggest the term referred to a variety of almonds originally grown along the Jordan River characterized by long, thin, slender, rather smooth kernels in thick, heavy shells. Still others believe that Jordan is a corruption of the name of the town of Verdun in the northeast of France. In the 13th century, when the medieval crusaders brought sugar to Europe after their campaigns in the Holy Land, it was very valuable and considered medicinal. During that time, an apothecary in Verdun began coating other medicines with sugar (calling them dragées) to make them easier to take. The town of Verdun became very well known for its dragées de Verdun. Other chocolate dragées with multi-colored candy shells include the M&M's, initially designed to allow easy transport and consumption of chocolate for the U.S. military, have evolved into a popular candy, but are also sold as decorative dragées in 25 different colors. Used to increase tolerability of bitter medication or merely to compel consumption, medicated candies or sugar coated pills can be referred to as dragées (e.g., Ayds was a popular weight loss candy in the 1980s). A chocolate cake decorated with icing, strawberries, and silver metallic dragées. Another form of dragée is a small sphere of sugar, in the Commonwealth often called cachous, used primarily in the decoration of cookies, cakes, and other forms of bakery. These are produced in various sizes, typically 3 to 4 mm (0.12 to 0.16 in) in diameter. This is larger than nonpareils and smaller than large pearl tapioca. Silver dragées have long been used for both wedding and holiday food decoration. More recently, metallic gold, copper, rainbow colors (red, green, blue, etc. ), and pearlescent colors have become available. The U.S. Food and Drug Administration considers the metallic-finish dragées to be inedible, and they are sold with a notice that they are for decorative purposes only. Early in the 20th century, the silver finish may have contained mercury (it no longer does). The sale of these dragées was banned for some time. Although the metallic-finish dragées can be purchased in 49 U.S. states, they are no longer sold in California due to a 2003 lawsuit against several sellers. However, in other countries (including the United Kingdom) they are classified as food items. ^ From Greek τραγήματα tragēmata "sweets, treats" (cf. τρώγω "to eat") through Latin tragēmata "sweets" and French la dragée "a sweet with almond filling". ^ Chu, Anita. Field Guide to Candy: How to Identify and Make Virtually Every Candy Imaginable. Philadelphia: Quirk, 2009. ^ E. B. Jackson, ed. (1999). Sugar Confectionery Manufacture (2nd ed.). Springer. p. 251. ISBN 978-0-8342-1297-8. ^ "UK Wedding Favours: Wedding favours, sweets and inspirational wedding ideas". UK Wedding Favours. Retrieved 2018-02-24. ^ Superior Nut Company. 2010-01-19. The Story of Jordan Almonds. Retrieved 2010-01-28. ^ a b c d "Jordan Almonds – The Delicious Mystery – Candy Atlas". Candy Atlas. Retrieved 2015-10-29. ^ Brewer's Dictionary of Phrase and Fable, 17th edition, 2005, p. 750. ^ "CPG Sec. 570.100 Jordan Almonds – Common or Usual Name". Fda.gov. 1941-10-20. Retrieved 2013-01-06. ^ Meisler, Andy (December 18, 2005). "A Tempest on a Tea Cart". The Los Angeles Times. Wikimedia Commons has media related to Dragée. Look up dragée in Wiktionary, the free dictionary.